The authentic Italian flavor and texture of Pasta Partners' handmade pasta will give a gourmet flair to all your meals and take you back to old Italy. No cholesterol, no preservatives, and no added salt make this pasta a great choice for the health-conscious without sacrificing the taste. First time tried the product of Pasta Partners and was incredibly happy with it!!!!! 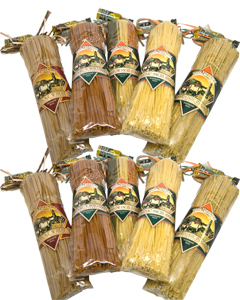 I love pasta, and this product was just very rich and flavored. Just some olive oil and some olives-and you got yourself a fancy dinner:)!!! Wish it was a bit cheaper, I would never shop for pasta elsewhere:)!!! !